You are here: Home / Dog Health / Take the GlycoFlex Challenge with Us! We’ve been eagerly awaiting this challenge for some time. Well, it’s finally here! It’s one of the best joint supplements I have found. The new GlycoFlex® Plus contains a whole lot of helpful stuff besides just glucosamine, chrondroitin, and MSM – the standards for joint supplements. It also contains antioxidants such as omega 3 fatty acids, vitamin E, C, and grapeseed extract. The part I am most excited about is the high levels of DMG-containing perna (green-lipped muscle). You can read more about the company that makes GlycoFlex, FoodScience Corporation, and DMG here but, basically, DMG helps the body produce large amounts of antioxidants. 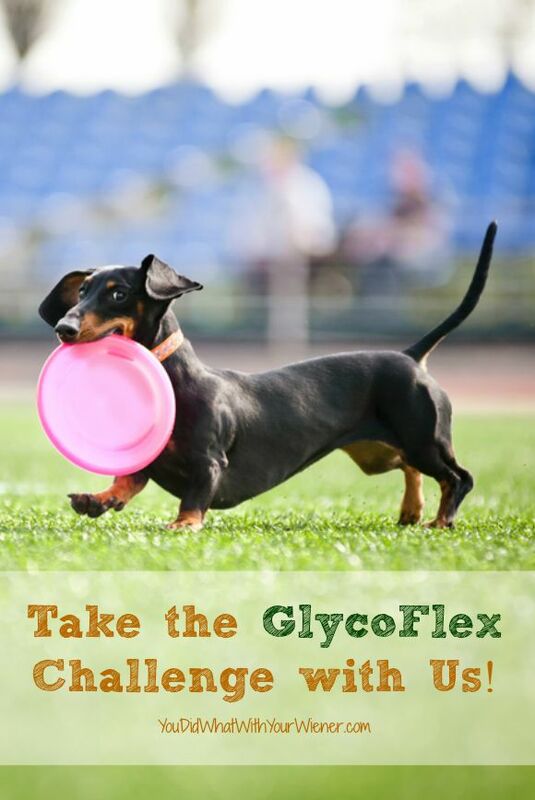 GlycoFlex Plus is made for dogs that are showing signs of slowing down and having a harder time getting around (i.e. helps “crotchety” senior dogs). Joint supplements can help the pain and inflexibility of joints with arthritis. In the case of the GlycoFlex Canine hip & joint supplement, it is clinically proven to increase hind leg strength by up to 41%. However, Your dog doesn’t have to be crotchety and old to use joint supplements. Many people use them preventatively in dogs without any, or severe, signs of pain or trouble moving around (in fact, my acupuncturist lectured me on the importance of using a joint supplement preventatively for myself because, even though I do already have a bit of pain, it will help keep things from getting worse). A lot of people I know with highly active dogs – dogs that hike, do dock diving, do flyball, etc. – give their dogs joint supplements. So What is the GlycoFlex Challenge? The GlycoFlex Challenge is your opportunity to see how GlycoFlex Plus hip & joint supplement can strengthen your dog’s hind legs. The idea of the challenge is that you observe your dog before taking GlycoFlex, give it to them for 30-days, and then look for the changes. When you sign up for the challenge, you get a FREE 30-day supply of GlycoFlex Plus to try. Take a video of your dog which shows* hind leg weakness or mobility challenges before GlycoFlex. (*Although Chester’s back leg sometimes gives out on him, I wasn’t able to capture it on video so I just took a video of him climbing the stairs. I really wish I could have caught his leg giving out so I am going to keep trying). Visit GlycoFlexChallenge.com to sign up, upload your video, and request your free GlycoFlex. Give your dog GlycoFlex every day for one month according to the directions on the package. Take a video of your dog after completing one full month of GlycoFlex (take the video in the same way as your “Before GlycoFlex” video). Chester is still pretty spy for 13 years old. I’ve definitely noticed signs of him slowing down this past year or so though. It started when he stopped being able to keep up with all of our brisk walks. Then I noticed that he was slower to get up from the dog bed and stiffer when walking to the back door. Now his back leg sometimes gives out when he is hopping or climbing, causing him to slip or stumble. I am hoping that I see less of that stuff after 30-days of giving him GlycoFlex Plus. Of course, when it came to my video, I couldn’t capture his leg giving out. Those things never happen on queue you know? I tried several times but finally just settled for a video of him climbing the stairs. This is the “before” video I submitted for the challenge. He looks like he doesn’t have any trouble, right? Honestly, I don’t know if I will be able to capture any differences before and after GlycoFlex on video. I will notice it myself though and will share what I see with you. I’ll check in with you mid-month about how it’s going and then share the “after” with you in 30 days. It’s more fun to do these challenges in a group. We would love it if you took the challenge side-by-side with us and shared your experience. Get your video today and sign up here. Please let us know if you sign up by commenting on our Facebook page or in the comments below. I’m so excited to follow along with everyone who does the challenge. I’m always on the look out for joint supplements that people have great things to say about and I’ve heard about this one from a few dog lovers. I know you have tried a lot of other joint supplements. We’ve tried several ourselves. I’ll be sure to let you know what I think of this one. Is there research to support it is helpful? My vet told me that their was no science for glucosamine to work, but people reported it did. I was just wondering about the science. Good question. I am not sure about glusosamine. The key ingredient in this chew is the DMG and GlycoFlex HAS been clinically proven to increase hind leg strength in dogs up to 41%. The other ingredients are just gravy 🙂 I am realistic though and know not every dog will get the same results. I am very interested to see how Chester does on it. So excited to follow along with this challenge! I always try and get people to start their giant breeds on joint supplements as early as possible. Not only is it preventative, but it helps with any growing pains during those first few years. We’re loving this product and hope others see success with it! I know Chester loves the taste for sure! 🙂 Whether I SEE big results or not, I know that giving him a joint supplement now will help him later down the road. He’s still active for his old age and I hope to keep him that way for as long as possible. Due to Boca’s weird eye issues, our ophthalmologist suggested it might be a good idea to put her on a joint supplement, because a lot of tropical/parasite-driven diseases that may have affected her eyes can also affect the joints. We will definitely be looking into this one. Huh. I never would have thought of that. Makes sense though. What a great challenge to take for people and their dogs who are showing signs of slowing down or getting around so they can see the benefits of giving their dogs GlycoFlex. My dogs are not ready for this yet but I look forward to following you and to reading your updates to see if you notice improvements while giving Chester GlycoFlex Plus. Actually, my vet tells me (and many people I know do it) that it’s best to start giving a joint supplement before your pet shows signs of problems. My own doctors tell me that if you start it before there are problems, it will help delay problems down the road. 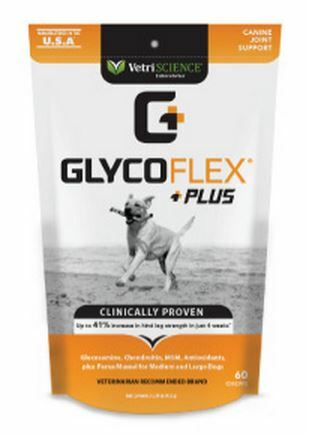 The GlycoFlex plus is probably overkill for a pet not showing signs of joint issues but that’s why there is a GlycoFlex I, II, III and Plus – so you can get the right dose for the right stage. Gretel is 5 years old and shows zero signs of joint problems. She’s active though and I don’t want her to develop any if possible. I have her on level I until she needs something stronger. I started Mr. N on a joint supplement a few months ago as a preventative measure. He isn’t showing any signs of slowing down or pain but he had a leg fracture as a puppy. I’ll have to look into this one after we finish our giant stockpile of supplements from a giveaway. That is good stuff. Since I am not a fan of the taste , I suspect that is what those little dark bits are in my food. Ma thinks she is being sneaky in cutting them up in tiny pieces and mixing it with my dinner but I know what it is. I eat it to make her happy. Happy Ma’s make a happy poodale. This made a difference in my mobility. I had started slowing down a bit but after about 2 weeks I noticed i could chase that poodle ball a little longer. Hope a lot of people take the challenge. You don’t like the taste?? Silly Carma. Chester and Gretel love them. Personally, I find them to be a little stinky… which is probably WHY they like them 🙂 Glad GlycoFlex helped you. I agree with you…GlycoFlex is one of the best products I have found for joint supplements for dogs. I am definitely going to participate in this challenge with my 13 year old Border Collie, Crash! Great! Happy to have you join the challenge because I definitely respect your opinion. Katie is also 13 but a large dog (Kuvasz), so she is pretty slow these days. We are using a different supplement as well as chiropractic treatments both of which have really helped a lot. Hope this works well for Chester. We tried at least 5 other supplements, but none really did much. I think different ones work better for some dogs than others. In case the one we are on now stops working, we will definitely keep this in mind. I agree that different supplements work for different dogs. This is the first one we’be tried with DMG so it will be interesting to see if that makes the difference we’ve been looking for. I have more dogs than less who could benefit from this challenge but two come to mind right off the bat – my at least 10 yr old Bloodhound, whose hind legs showed muscle atrophy when I adopted her summer of 2014, and my 7 y/o tweenie Dachshund, Danny Quinn. Seeing Chester go up the stairs reminded me how Danny now sets himself up for the stairs, the most of which is 4. He’ll get over the first one, then adjust his stride to he can hop up the rest. It should be (HA) a good video. Ellie Mae, the Bloodhound, toes under on occasion. Both currently get, at least twice a week when I remember, Drs. Foster and Smith Chondroitin supplement. When I give it daily, I see improvement in just a week – but I forget and get in a hurry…..yada, yada. Will check this out. Thank you. Sorry it took me so long to respond. I’ve been feeling under the weather. You make a very good point about Chester “sets himself up” for the stairs. I tend to think he doesn’t have any issues using stairs but it is true that he never had to “set himself up” when he was younger. The WAY he uses the stairs has changed over the years and I see now that it really is an indicator that he is having some difficulty with stairs. I am sure some of the way he sets himself up is a habit now but it will be interesting to see if I notice any difference in his “set up” or gait in the after video I will be filming soon.